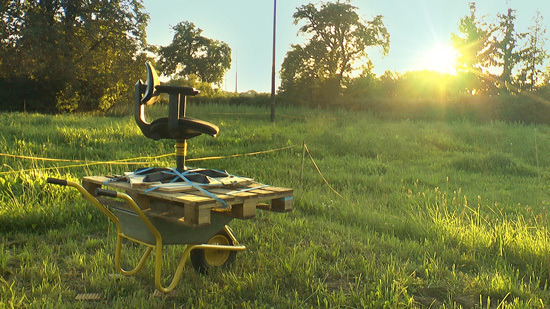 Looking for a spinning tool, Jens Alder invented a superb wonderfull rapid office chair solution. In hindsight, it is one of my favourite performance sculptures ever. Jens Alder just tied a swivel chair with ropes on a usual Euro pallet and winded a clothesline arround the center leg. 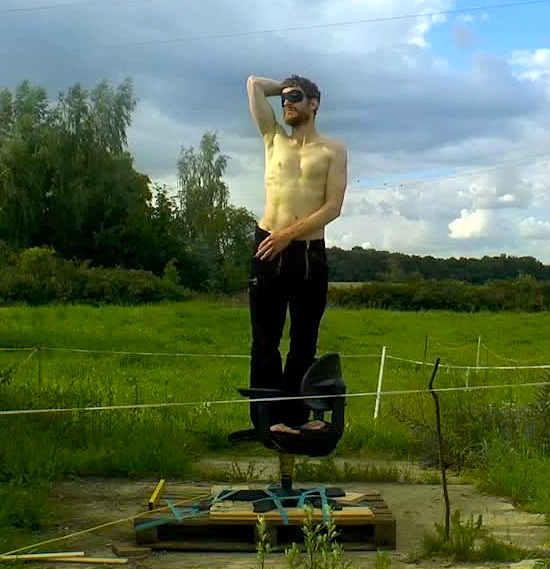 While the video shoot Thomas Fehlmann was unwinding the clothesline longsuffering for hours, as Jens was standing wobbly on the seating miming an adonis − turning and turning. So I am really happy, that I decided not to cover the chair behind high gras all along and unmasked my own true star at the end of the clip.